Powered by Hunter's submerged water wheels with two engines, 16 x 26"
Abandoned at pier and subsequently sank. 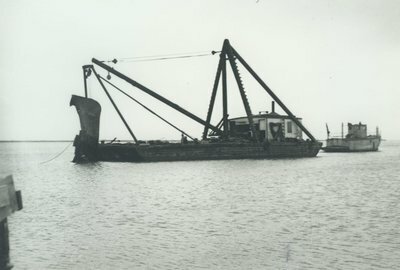 Wreckage removed in several harbor improvement projects, 1939 and 1990s. 1843 December 21 First launched. 1844 October 18 Aground Buffalo, NY, Lake Erie; got off. 1845 Rebuilt as sidewheel steamer; 97 x 18.6 x 8; 130 old style tons. Renamed SURVEYOR. 1845 - 1878 Surveyed upper Lakes harbors for U.S. Government. 1878 Sold out of US Government service. 1878, Apr 5 Crockett McElroy, St. Clair renamed JULIA, US75987 100 x 18.2 x 8.2, 102.59 gross tons, passenger steamer on St. Clair, River, MI. 1882, Jun 9 CR. Freyberg, Sheboygan, WI 105.59 gross tons & 51.30 net tons, rafting tug (sidewheel). 1888, Oct 26 Abandoned at Sheboygan, "unfit for service", sunk in outer harbor.